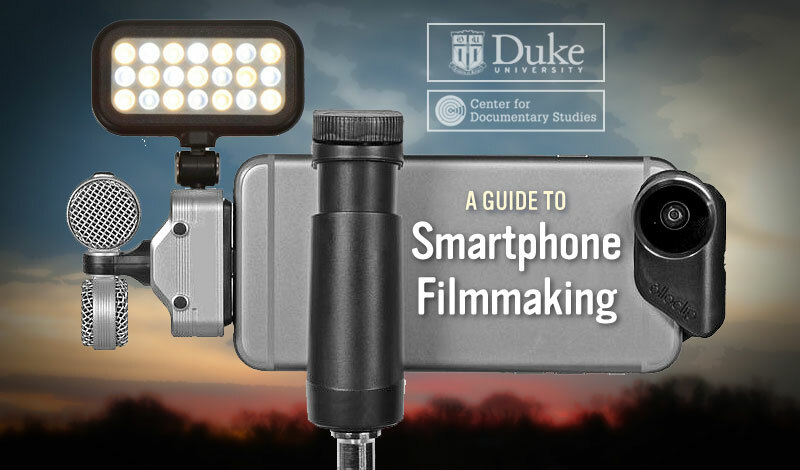 New for Spring 2018, this online class from at the Center for Documentary Studies at Duke University will show you how to put together a smartphone video rig including lights, microphones, stabilizers and lenses. We’ll also cover on the foundations of filmmaking, including pre-production, shot composition, building a soundtrack, and editing. By the end of the six weeks, each student will have made a short smartphone video as a class assignment. Whether you use an iPhone, Android, Huawei, or Samsung, A Guide to Smartphone Filmmaking will help you take your videos to the next level. Emmy and Cannes Lions award-winning producer Hal Goodtree has worked for the National Football League, the New York Times and with screen luminaries such as James Earl Jones, Cindy Crawford and legendary documentarian Albert Maysles. His latest project, a documentary about American Tobacco, earned a #1 rating in prime time when it was broadcast on WRAL in December 2014. His work has been awarded an Emmy, a Cannes Lion, and most recently, Best Short Documentary at the 2015 Longleaf Film Festival. Additional course information – A late-model computer, fast internet connection, and built-in camera are recommended, though not required. Students with less than optimal hardware or internet connections are welcome to take the course, though it may be difficult to participate fully in virtual meetings.